Celebrate your big day with our chapel in the sky packages. You'll see all of the Las Vegas Strip from 108 floors up. You and your partner will exchange marriage vows high above all the action. At over 1,000 feet tall we offer the most unique Ceremonies in the sky, providing an unrivaled view for your special day. 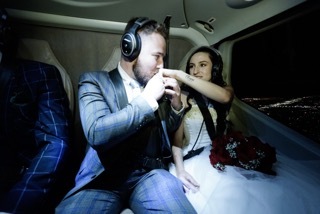 Whether you would like a intimate ceremony in a Helicopter flying of the Strip, the wedding chapel at 108 floors, or the private ourdoor balcaony on level 122 we have something for every group size. Guests can enjoy a private ceremony offering the most romantic views of the Strip, including the iconic Fountains of Bellagio. These options are perfect for proposals, elopements and unforgettable Las Vegas weddings. Couples can add such amenities as flowers, music, photography, cinematography, and even an Elvis minister to get the party started 1,000 feet in the air!